Who is next for the Zionists putsch? How much longer can the corporate media continue to vilify Corbyn? What’s so great about David Crosby’s ‘If Only I Could Remember My Name’? Shopping malls are unforgiving, soulless and unfriendly places. For many people, frequenting the modern shopping mall is a deeply alienating and physically damaging experience. It brings with it a recognition of how some groups of people are being coerced and physically situated in the world – how citizens think and act is increasingly being determined by ‘choice architecture’ – which is all-pervasive: it’s situated at a political, economic, cultural, social and material level. Hostile architecture – in all of its forms – is both a historic and contemporary leitmotif of hegemony. Architecture, in both the abstract and the concrete, has become a mechanism of asymmetrically changing citizens’ perceptions, senses, choices and behaviours – ultimately it is being used as a means of defining and targeting politically defined others, enforcing social exclusion and imposing an extremely authoritarian regime of social control. Citizens targeted by a range of ‘choice architecture’ as a means of fulfiling a neoliberal ‘behavioural change’ agenda (aimed at fulfiling politically defined neoliberal ‘outcomes’) are those who are already profoundly disempowered and, not by coincidence, among the poorest social groups. The phrase choice architecture implies a range of offered options, with the most ‘optimal’ (defined as being in our ‘best interest’) highlighted or being ‘incentivised’ in some way. However, increasingly, choice architecture is being used to limit the choices of those who already experience heavy socioeconomic and political constraints on their available decision-making options. Urbanomics and the cutting edge of social exclusion: what is ‘defensive architecture’ defending? Social exclusion exists on multiple levels. The distribution of wealth and power, access to citizenship rights and freedoms, political influence and consideration are a few expressions of inclusion or exclusion. It also exists and operates in time and space – in places. Our towns and cities have also increasingly become spaces that communicate to us who ‘belongs’ and who isn’t welcome. From gated communities and the rise of private policing, surveillance and security to retail spaces designed to fulfil pure profiteering over human need, our urban spaces have become extremely anticommunal; they are now places where an exclusive social-spatial order is being defined and enforced. That order reflects and contains the social-economic order. Retail spaces are places of increasing psychological and sensual manipulation and control. Hostile architecture is designed and installed to protect the private interests of the wealthy, propertied class in upmarket residential areas and to protect the private profiteering interests of the corporate sector in retail complexes. The very design of our contemporary cities reflects, directs and amplifies political and social prejudices, discrimination and hostility toward marginalised social groups. Hostile architectural forms prevent people from seeking refuge and comfort in public spaces. Places that once reflected human coexistence are being encroached upon, restrictions are placed on access and limits to its commercial usage, demarcating public and private property and permitting an unrestrained commodification of urban spaces and property. In 2014, widespread public outrage arose when a luxury London apartment building installed anti-homeless spikes to prevent people from sleeping in an alcove near the front door. 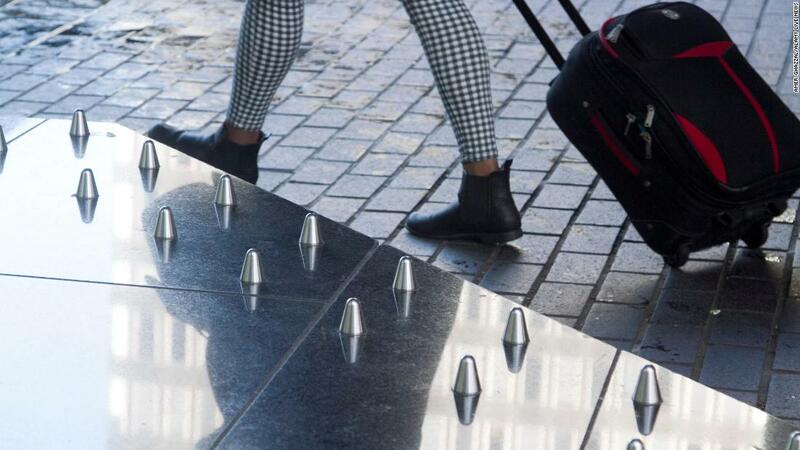 The spikes, which were later removed following the public outcry, drew public attention to the broader urban phenomenon of hostile architecture. Dehumanising ‘defensive architecture’ – ranging from benches in parks and bus stations that you can’t actually sit on, to railings that look like the inside of iron maidens, to metal spikes that shriek ‘this is our private space, go away’ – is transforming urban landscapes into a brutal battleground for the haves and socioeconomically excluded have-nots. The buildings and spaces are designed to convey often subtle messages about who is welcome and who is not. Hostile architecture is designed and installed to target, frustrate deter and ultimately exclude citizens who fall within ‘unwanted’ demographics. Although many hostile architecture designs target homeless people, there are also a number of exclusion strategies aimed at deterring congregating young people, many of these are less physical or obvious than impossibly uncomfortable seating, which is primarily designed and installed to prevent homeless people from finding a space to sleep or rest. However, the seating also excludes others who may need to rest more frequently, from sitting comfortably – from pregnant women, nursing mothers with babies and young children to those who are ill, elderly and disabled citizens. When the purpose of public seating isn’t taking the weight off your feet and providing rest. Some businesses play classical music as a deterrent – based on an assumption that young people don’t like it. Other sound-based strategies include the use of high-frequency sonic buzz generators (the ‘mosquito device’) meant to be audible only to young people under the age of 25. Some housing estates in the UK have also installed pink lighting, aimed at highlighting teenage blemishes, and deterring young males, who, it is assumed, regard pink ‘calming’ light as ‘uncool’. There is little data to show how well these remarkably oppressive strategies actually work. Nor is anyone monitoring the potential harm they may cause to people’s health and wellbeing. Furthermore, no-one seems to care about the psychological impact such oppressive strategies have on the targeted demographics – the intended and unintended consequences for the sighted populations, and those who aren’t being targeted. Charles Pierre Baudelaire wrote a lot about the transformation of Paris in the 1850s and 1860s. For example, The Eyes of the Poor captures a whole series of themes and social conflicts that accompanied the radical re-design of Paris under Georges-Eugène Haussmann‘s controversial programme of urban planning interventions. Baron Haussmann was considered an arrogant, autocratic vandal by many, regarded as a sinister man who ripped the historic heart out of Paris, driving his boulevards through the city’s slums to help the French army crush popular uprisings. Republican opponents criticised the brutality of the work. They saw his avenues as imperialist tools to neuter fermenting civil unrest in working-class areas, allowing troops to be rapidly deployed to quell revolt. Haussmann was also accused of social engineering by destroying the economically mixed areas where rich and poor rubbed shoulders, instead creating distinct wealthy arrondissements. “That evening, feeling a little tired, you wanted to sit down in front of a new cafe forming the corner of a new boulevard still littered with rubbish but that already displayed proudly its unfinished splendors. The cafe was dazzling. Even the gas burned with all the ardor of a debut, and lighted with all its might the blinding whiteness of the walls, the expanse of mirrors, the gold cornices and moldings…..nymphs and goddesses bearing on their heads piles of fruits, pates and game…..all history and all mythology pandering to gluttony. On the street directly in front of us, a worthy man of about forty, with tired face and greying beard, was standing holding a small boy by the hand and carrying on his arm another little thing, still too weak to walk. He was playing nurse-maid, taking the children for an evening stroll. They were in rags. The three faces were extraordinarily serious, and those six eyes stared fixedly at the new cafe with admiration, equal in degree but differing in kind according to their ages. As for the baby, he was much too fascinated to express anything but joy – utterly stupid and profound. The parallels here are concerning the right to occupy a public space, which is contested by the author’s lover who wants someone to assert proprietorship over it and control its uses. The cafe is not exactly a private space either; it is a space within which a selective public is allowed for commercial and consumption purposes. What message do hostile architectural features send out to those they target? Young people are being intentionally excluded from their own communities, for example, leaving them with significantly fewer safe spaces to meet and socialise. At the same time, youth provision has been radically reduced under the Conservative neoliberal austerity programme – youth services were cut by at least £387m from April 2010 to 2016. I know from my own experience as a youth and community worker that there is a positive correlation between inclusive, co-designed, needs-led youth work interventions and significantly lower levels of antisocial behaviour. The message to young people from society is that they don’t belong in public spaces and communities. Young people nowadays should be neither seen nor heard. It seems that the creation of hostile environments – operating simultaneously at a physical, behavioural, cognitive, emotional, psychological and subliminal level – is being used to replace public services – traditional support mechanisms and provisions – in order to cut public spending and pander to the neoliberal ideal of austerity and ‘rolling back the state’. It also serves to normalise prejudice, discrimination and exclusion that is political- in its origin. Neoliberalism fosters prejudice, discrimination and it seems it is incompatible with basic humanism, human rights, inclusion and democracy. The government are no longer investing in more appropriate, sustainable and humane responses to the social problems created by ideologically-driven decision-making, anti-public policies and subsequently arising structural inequalities – the direct result of a totalising neoliberal socioeconomic organisation. For example, homeless people and increasingly disenfranchised and alienated young people would benefit from the traditional provision of shelters, safe spaces, support and public services. Instead both groups are being driven from the formerly safe urban enclaves they inhabited into socioeconomic wastelands and exclaves – places of exile that hide them from public visibility and place further distance between them and wider society. Homelessness, poverty, inequality, disempowerment and alienation continue but those affected are being exiled to publicly invisible spaces so that these processes do not disturb the activities and comfort of urban consumers or offend the sensibilities of the corporate sector and property owners. After all, nothing is more important that profit. Least of all human need. Last year, when interviewed by the national homelessness charity Crisis, rough sleepers reported being brutally hosed with water by security guards to make them move on, and an increase in the use of other ‘deterrent’ measures. More than 450 people were surveyed in homelessness services across England and Wales. 6 in 10 reported an increase over the past year in ‘defensive architecture’ to keep homeless people away, making sitting or lying down impossible – including hostile spikes and railings, curved or segregated, deliberately uncomfortable benches and gated doorways. Others said they had experienced deliberate ‘noise pollution’, such as loud music or recorded birdsong and traffic sounds, making it hard or impossible to sleep. Almost two-thirds of respondents said there had been an increase in the number of wardens and security guards in public spaces, who were regularly moving people on in the middle of the night, sometimes by washing down spaces where people were attempting to rest or sleep. Others reported noise being played over loudspeakers in tunnels and outside buildings. Crisis chief executive Jon Sparkes said he had been shocked by the findings. He said: “It’s dehumanising people. If people have chosen the safest, driest spot they can find, your moving them along is making life more dangerous. ‘Defensive architecture’ is a violent gesture and a symbol of a profound social and cultural unkindness. It is considered, calculated, designed, approved, funded and installed with the intention to dehumanise and to communicate exclusion. It reveals how a corporate oligarchy has prioritised a hardened, superficial style and profit motive over human need, diversity, complexity and inclusion. Hostile architecture is covert in its capacity to exclude – designed so that those deemed ‘legitimate’ users of urban public space may enjoy a seemingly open, comfortable and inclusive urban environment, uninterrupted by the sight of the casualities of the same socioeconomic system that they derive benefit from. 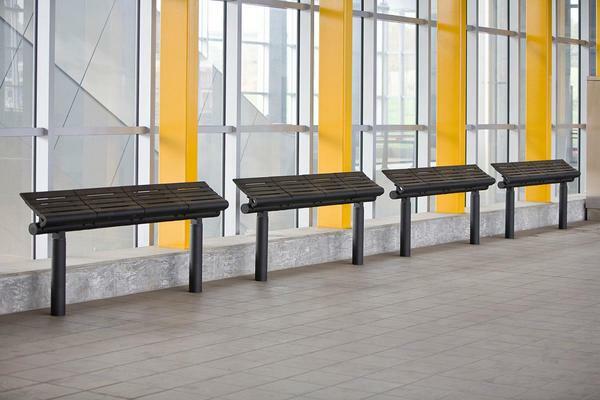 Superficially, dysfunctional benches and spikes appear as an ‘arty’ type of urban design. Visible surveillance technologies make people feel safe. It’s not a society that everyone experiences in the same way, nor one which everyone feels comfortable and safe in, however. The article above is an edited extract from the blog of writer and human rights activist, Kitty S Jones. Please support Ms Jones’ research and writing of informative, insightful and independent articles, by making a small donation on her website. Thank you. I thought this article was excellent and it was ironic that I was considering this issue in my own local environment,where larger far more expensive housing is being built and these estates are generally small in size but always gated &provided with security. I live in East Berkshire where at least we have had some larger estates but with smaller houses put up owing to the substantial increase in demand but the numbers of affordable housing has decreased. This is because the developers know how to circumvent the planning rules by allegedly buying up land on other sites where they do build some affordable housing or dwellings. More often than not however a payment seems to have been made or some other deal struck such as an environmental open space. Your comments about the unfriendly environment especially in the modern shopping centres is in my opinion very relevant. I had some involvement in this industry as a building surveyor and a project manager. I had it on very good authority that the reason why there is much less seating NOW for the general public is because they do not want to promote the idea that there is an area where you can sit down and rest! Indeed in older shopping centres when they refurbish they remove such seating. If any seating is provided it is usually only in small coral areas where you have to effectively pay by means of buying café produce. They don’t want people resting they want them moving from shop to shop. Obviously if you do provide seating then as far as the retaiil estate managers are concerned it is perceived as a magnet for “undesirables”. I believe that this is what happened in the recent Exeter shopping development where people were physically evicted especially at night time. We have allowed the architects and planners to create along with the government hostile environments, certainly across parts of London but elsewhere throughout tthe countryy and this has led to an increase in violence, especially amongst the young. 10 years of austerity have expedited this problem with the removal of community centres, local police stations and other facilities accordingly. Perhaps when the violence creeps into the middle class areas then we may see the government change its stupid policy and start to take note of the social commentators accordingly. Thanks Nigel. Very interesting commentary/observations of which I agree wholeheartedly. Daniel.